festive occasions and sporty events. may i use this for a contest on 99designs? Can I use this font for a company name? Are the swashes included with this font?! It says "commercial use allowed" so you are fine. C'est sombre, c'est efficace, moi j'aime bien. Can I have this font to do machine embroidery and sell it as an embroidery design? 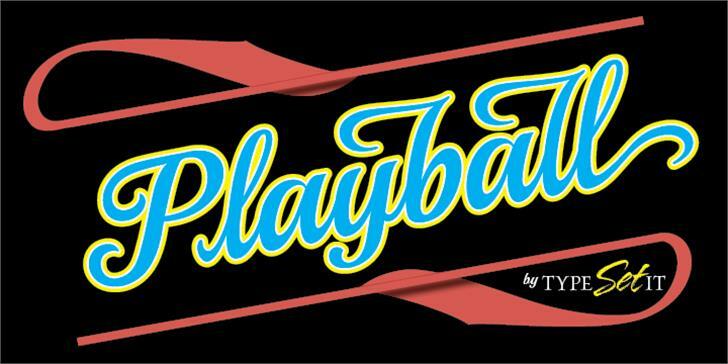 Copyright (c) 2011 TypeSETit, LLC (typesetit@att.net), with Reserved Font Name "Playball"
Playball is a trademark of Robert E. Leuschke.